As the 2013 US National YoYo Contest quickly approaches, YoYoNews has lots of top-notch coverage planned, including in-depth analysis of the top contenders for the title this year in all divisions with commentary from past champions, interviews, resources and below, promo videos to get you guys excited and inspired for the United States’ top competition. Get registered over at contest.nationalyoyo.org and start practicing! Keep an eye out for the coverage! Here’s a C3YoYoDesign-shaped bullet from Poland…a new video from Mihai Suster and Maciek Cwynar with plenty of solid 1A & 5A play. Not sure why they went with the “Vo-Mitation” play on the yoyo’s name, but I’m going to chalk it up to language barrier. We don’t know much about the Hebei YoYo Contest, but we know that our friends at C3YoYoDesign posted freestyles! Enjoy! Patrick Canny recently dropped his annual clip, and he shows off a lot of impressive stuff. Patrick has technical, innovative and visually appealing tricks–all recipes for success. 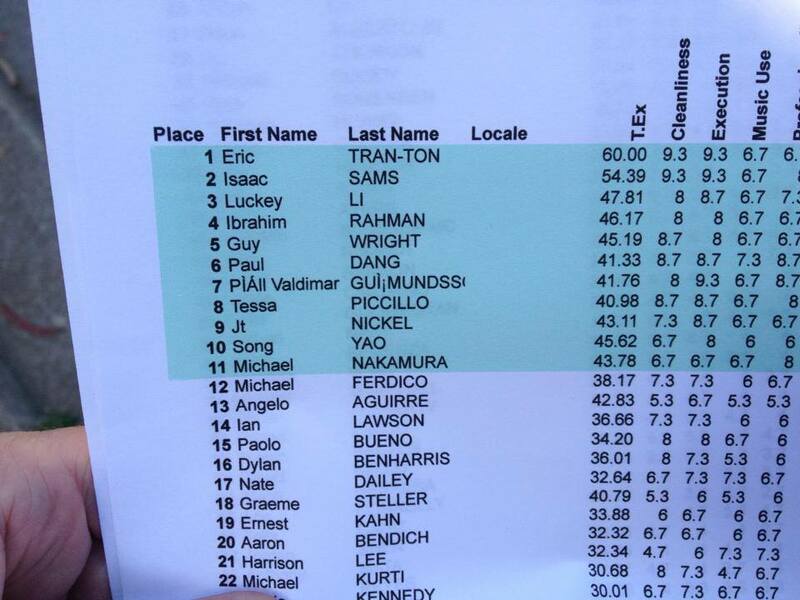 Patrick has been climbing the ladder of the 1A scene, recently taking 2nd place after US National Champ Zach Gormley at South Central Regionals and also taking a respectable 29th place at the World YoYo Contest in 1A preliminaries. Look for Patrick to keep rising and start taking some titles of his own back to Fort Collins. Give his most recent video a look! 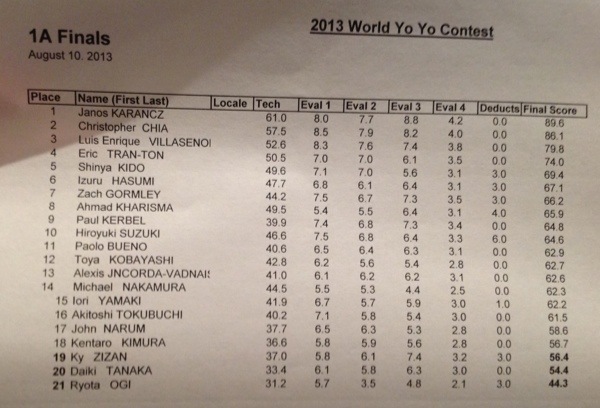 Congratulations to Takeshi Matsuura and Janos Karancz, our 2013 World YoYo Champions in the 5A and 1A Divisions! Our new Artistic Performance World Champions are Spination, a team composed of Yu Kawada and Tomiyuki Watanabe. The 5A division ran with only two players making mostly clean runs. Tyler Severance had tremendous trick diversity in his routine, but couldn’t match Takeshi Matsuura’s speed and technical difficulty in the judge’s eyes. But the amazing performances from both players guarantee that counterweight hopefuls around the world have their work cut out for them if they want to be a contender for next year’s title. This years World YoYo Contest had the fiercest competition ever in 1A, with the player pool starting at just under 200 competitors, including seeded champions. There were tons of strong performances, but Hungarian slack master Janos Karancz was the clear winner with a remarkably clean and terrifyingly difficult routine. His slack tricks border on the unimaginable, and he nailed them all with ease for his first world title. Spination’s AP routine was an incredibly executed and highly entertaining slapstick routine that mimiced old silent films with a “cops and robbers” story that had the audience begging for more. Brilliantly performed by Kawada and Watanabe, Spination was the clear winner in a field of excellent routines. 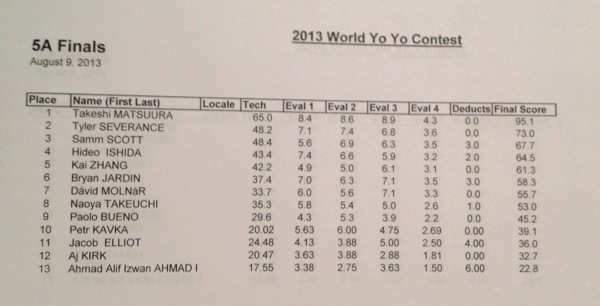 The semi-finalists have been posted for the 1A Division at this year’s World YoYo Contest, and it’s a hell of a list! 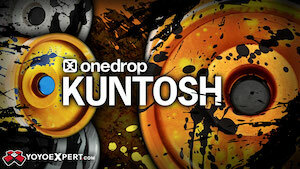 As we gear up for the 2013 World Yo-Yo Contest, we take a step back to appreciate and admire the greats of years past. We will be posting the top 5 in each division in the weeks leading up to the World Yo-Yo Contest. The Single A Division has grown and evolved from the division for people who “couldn’t play two-handed” into the most creative and competitive division in every single yoyo contest in the world. At any given contest, the number of contestants in the 1A Division will outnumber all other divisions combined by 5 to 1. One yoyo, one string, endless possibilities. It was difficult to select only five players for our list…we could easily have filled a Top 20. But the players listed below have proven themselves above and beyond their competition, and have inspired entire generations of players to follow them. In 2003 Johnnie DelValle won the big three: Bay Area Classic, US Nationals and Worlds. In his iconic 2003 World routine he was the first to ever incorporate a range of body, finger and arm grinds into his routines. In addition, he had technical slack and a striking stage presence (who could forget the dramatic removal of his over shirt?) that perfectly complimented his style. Jensen’s run to the world title in 2010 saw a man unbeatable. With an array of US contest wins at the Bay Area Classic, Pacific Northwest, California State, and twice Japan’s 44 Clash, Jensen dominated parts of 2009 and all of 2010 capped off by his decisive win on the World stage. Jensen was known for his incredible flow and style in combination with his eccentric personality which inspired endless yo-yoers. Jensen remains an inspiring figure in yo-yo today. Innovator of some of the most classic string tricks today, Tomonari ‘Black’ Ishiguro was rewarded with a world title in 2001. Many of his trick elements are still in use today and that only speaks to the level of creativity ‘Black’ brought to the table. His unforgettable performances, most popularly his matrix themed routines, demonstrated he was more than just a competitor; now retired, Black is a full time performer and inspiring many more through the theatrical aspect of yo-yoing as well as his wildly popular TED Talk. Another innovator of some of the most classic string tricks today, Yuuki Spencer is undoubtedly a legend in the world of yo-yo. As the only player other than Hiroyuki to win more than one world title in 1A, Yuuki is technically unmatched. His 2002 and 2007 routine both demonstrated his creativity; in particular Yuuki’s 2007 routine injected a level of intensity and energy that was unheard of at any level of yo-yo competitions. Yuuki’s contributions to yo-yo bolster his resume and secure his spot near the top of yo-yo’s most competitive division. Over a decade of top 3 placing in the World—it is not difficult to place Hiroyuki ‘Mickey’ Suzuki as the greatest single A player. His incredible choreography, ridiculous speed and technically difficult tricks have proven time and time again why he is the best. Capturing his fourth World title after a full eight years after his first, Hiroyuki has managed to maintain an incredible pace of innovation, accuracy and passion. With no signs of slowing down or retiring from competition, he is clearly not done. Who do you think are the greatest 1A players of all time? Feel free to post your thoughts below! As a reminder, these rankings take into consideration competitive players from around 2000 and on. Another batch of new tricks from 2013 Ohio State X Division Champion, Darnell Hairston. This will be his first year competing at the World YoYo Contest…wish him luck! 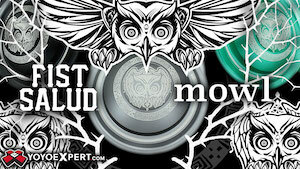 Yoyo used is the Puffin by CLYW. YoYoFactory just dropped a great new promo video for the 2013 overhaul of their popular competition model, the Superstar. John Ando is definitely a contender for 1A at the World YoYo Contest this year, and this video cements his reputation as one of the greatest and most influential 1A players of all time. Harold Owens III and Tyler Severance have given up another taste of what we can expect from them at the 2013 World YoYo Contest next month. As always, looks like the 1A and 5A divisions are going to have the fiercest competition. Yoyos used are the H.O.T. and Supernova by YoYoFactory. Riccardo Fraolini, one of Italy’s most creative players, just dropped this 1A clip showcasing his new signature throw “The Seed” from XCube. The video is a dreamy first person POV smorgasbord of neat concepts and saturated colors, with everything from behind-the-back finger spin transitions to a one-handed frog in a bag. 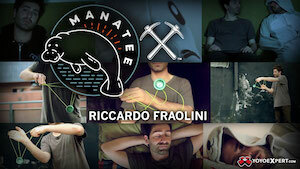 If you want more European yo-yo fun, you should definitely check out the R-Special videos on Riccardo’s youtube channel. Change your strings and get ready for another week’s worth of stuff you should probably learn! Here’s a trick with sudden movements that should probably end with a fly-away dismount except that I don’t have any half-spec bearings right now. 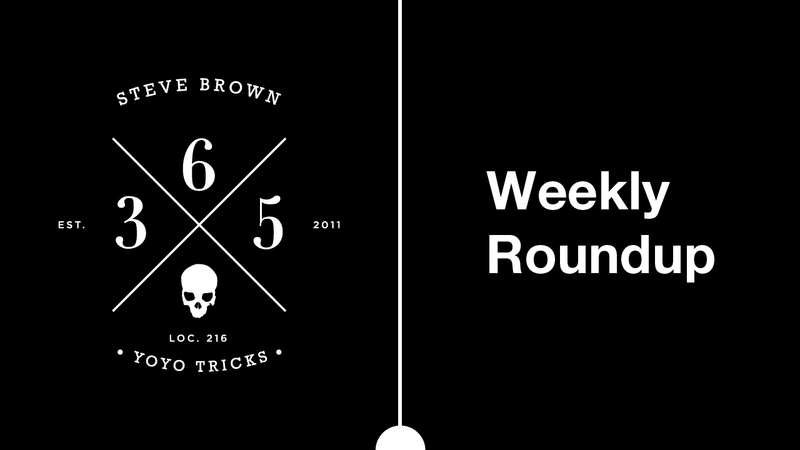 Spencer Berry gives us a really nice, stripped down trick that gets right to the point. Spencer made me think about triangles, so…. Ed Haponik comes out of nowhere with the hardest fixed axle trick we’ve ever seen. Damn, Ed! An extension of last week’s “Curls” trick. Brandon Jackson pops in for a guest spot with a trick inspired by old Sector Y videos. And Rafael Matsunaga throws down one of his all-time favorite counterweight tricks! Only 11 players are advancing to the 1A Finals at Bay Area Classic, and here they are! Good luck to all! And click here for the list of 2A – 5A finalists!